As far as I now the ‘skin’ of the flaperon is all carbon-reinforced laminate honeycomb. I can image what they can look for (maybe the ATSB did but did not mentioned this) is tiny molten fragments or just small fragments from the engine(core) embedded in the flaperon-skin. The paint on the flaperon seems mostly intact and shows no burning marks, only considering the images. Correction; ‘maybe the Frence did look at it’. But as we know will still have no detailed damage report on the flaperon from the Frence. Unlikely, as it would appear that the Malaysian government have suffered more collateral damage from the MH370 event than anyone else, not forgetting MH17. However, I do think it possible they have been spoofed into thing that they caused the disaster. I don’t have any hard evidence of where to apportion responsibility for the project, but there are very few countries/alliances with the contacts and resources to orchestrate such a large event. Perhaps an unforeseen error will yet shine some light on what happened, but I’m not holding my breath. Despite all “our” opinions, thoughts, ideas etc, the IG is again refered to and VL specifically as follows: Writing in his MH370 blog, Victor Iannello, a member of the Independent Group – the most respected think tank looking into the disappearance – says ……..
One would wonder if they are sponsored and if anybody would even know of this blog and its people writing on it, since “we” do get little credit? It feels like we are just a group of “outcasts” to whom nobody pays any attention. Disturbing if it is about finding the truth, or maybe not so if the Truth is not wanted to be found. Let’s see what this idea results in. The outer flap mechanism would result in the same movement to the rear for the same angular movement if the height of the flaperon hinges were the same as the flap’s above its ‘fixed point’ and the pivot link were fixed at the carrier. But the pivot link’s acute angle to the flap in fact will reduce as the flap is deployed in its rotation. This sends the flap further to the rear than the flaperon for the same angle of movement down, while the ‘height’ of the flap above the hinge point, the ‘fixed point’, reduces compared to the flaperon, increasing that movement. At the lesser deployment at take-off that throw difference would be less but also the droop schedule above for the flaperon could alter the relative angles. By the looks 20 degrees would be the only place where they are equally deployed by angle down. At that point the flap should have travelled further to the rear than the flaperon though less than in the ATSB diagram of full deployment. In between it looks as though the flaperon angle would be less than the flaps, making that difference more pronounced. What complicates all this is that at first glance the flaperon hinge depth is in fact more, increasing the throw of that, initially at least. Take a look and see if you can find an angle beyond close to housed where they could be aligned. The ATSB shows just the two positions with one aligned. Maybe there is another. I am unsure it makes much difference to you though as I thought you had your mind on a retracted ditching but Sullenberger used less than full flap..
@TBill. The flaperon trailing edge. Has your question been asked? I have not seen it raised but for my part I do not see it as an issue in heat and spatter terms. The flaperon paint and carbon fibre would be discoloured I think. Besides as you are obviously aware, as part of its design and proving account would be taken of full down projection into the entrained exhaust blast at take off thrust initially in a go round I think. Any spatter would follow that exhaust path, clear of the flaperon t.e. However theoretically there could be a fatigue issue if exposed like that for long. The reason the flaperon’s actuators are in by-pass until the late stage of take off is, from the Maintenance Manual, “..This decreases the flaperon actuator fatigue cycles caused by the engine exhaust…”. However I do not see how MH370 would have been flying around with high thrust and flaperons down and by its nature fatigue progresses slowly, even though failure once weakened is quick. A red herring here I think. Not too sure that helps you much. Thanx for your comments. In fact generally I’ve always appreciated reading your contributions. @Ge Rijn. Here is a portrayal of the locus of equal flaperon droop to flap position units in case of assistance. Unfortunately you will see the flap units beneath 15 are not plotted as linear. I have corrected that down to five flap units as you will see. The point to me is, the clip I posted shows a position/attitude in which the outboard-flap and flaperon are neatly in-line. The ATSB did not show or mention this possibility in their report on the outboard-flap. They only showed a fully retrackted and fully deployed outboard-flap combined with a flaperon in neutral position. They build one main argument of evidence the flaps were retrackted on this. We know now the flaperon is not in neutral position during a landing till touchdown (and after, if the spoilers are not deployed) but deployed/drooped also. As you mention/observed both will be in-line with eachother at ~20 degrees deployement (this is also ~about what the clip shows on take-off indeed). And this is actually the ~degrees used by Sullenburg during his ditch on the Hudson. In a controlled ditch-event the pilot of MH370 would probably use about the same ~20 degrees of outboard- flap deployment. But APU or engine power would be required to make deployment possible. The consensus still is there was no APU or engine power anymore shortly after 00:19:37. But this is in debat again after the failed search. Important to me now is, one piece of evidence brought forward by the ATSB about deployed or retrackted flaps seems clearly refuted by this. At least this evidence is not sound for it does not cover the deployment/drooping of the flaperon during a landing and the alinement around 20 degrees flap-deployment. And have to note, I think that your diagrams are not relevant in this case for they cover the aileron/flaperon movements. Anyway thanks for your thoughtfull comments again. They inspire thinking further. It would be nice if you could find and post similar diagrams that show the outboard-flap/flaperon movements combined. You can bet that many IG-members and contributors on VictorI’s blog also read Jeff’s blog. Several of them still comment on both as you can see often. So Jeff’s writings and his blog surely go not unnoticed by many and are also influential. To be more clear perhaps.. The evidence ATSB brought forward about alignment of the outboard-flap with the flaperon (that caused the sealpan damage in their view) in retrackted position, could also have happened in a ~20 degrees deployed and drooped position. In other words; in a ditch-configuration. @Ge Rijn, thanks for the feedback, appreciated. Was more eluding to others who for instance make comment about VL. Have not seen any comments about ideas of this group (could have missed it though), that’s what I find frustrating. But what about that new location? Wild card or believable??? @Ge Rijn. Presuming that the flap deployment units are near enough degrees, what the droop diagram indicates is that after the flap overtakes flaperon angular deployment at 1˚. It then is above the red and blue lines I drew by up to 5˚ deg, except where it stops at 20˚ and the flap catches up with it briefly. After that it leads the flap by up to 6˚, finishing 1˚ further down. What I put earlier is that the throw (movement along its arc of deployment in this case) of the flap will be greater per degree, that depending on the distance each is from its hinge point. De facto the ATSB photograph shows that at full deployment the flap throw far exceeds that of the flaperon, indicating the hinge point issue in fact favours flap relative throw at near enough the same degrees deployed. Because it moves along the arc, per degree, further per degree than does the flaperon it will always be ahead beyond the 1˚ point, even at 20˚. At deployments other than at the beginning and at 20˚, proportionately it will be even further ahead. I believe those are the mechanics so what you see at take-off, which you deduce is flap and flaperon trailing edge alignment, must be an illusion. First, in passing, since at deployments other than to 20˚ the flaperon will be angled further down than the flap, its trailing edge will be projecting, ie thrown, a little further than otherwise by that difference. More importantly though, the evidence presented in the ATSB report I quoted is that the flaperon rear spar penetrated/hooked under the flap’s upper skin just in front of its rear spar. In other words they were misaligned in degrees down at that point and there was a slight misaligned in throw. If this damage resulted after the flaperon separated in whole or part the misalignments could have been due to flaperon dynamics before the collision. If on the other hand this had resulted from closure of the gap between them before a separation, as Larry Vance envisages, there would not be this height disparity unless the flaperon was responding to a pilot, commanding right wing down. However I have my doubts that would explain the throw disparity. I cannot tell if your post on June 11 at 9:24 is meant to be serious. People who want to disappear for personal reasons? Paid crisis actors? I have occasionally wanted to disappear. No one ever approached me with an offer. Is there a web site to apply to? Would be good to know for the next time I have a low moment. Likewise, how does one audition to become a crisis actor? And why do such actors’ friends, family and neighbors, who see the same news we do, not recognize them as such when they appear? Why doesn’t anyone ever blow the whistle with a photo of them out of character snapped at a party or night out or from their high school yearbook? Meaning that people, you included, actually are aware it is all theater. Makes me wonder why they keep on with such charades, when sharp eyed skeptics such as you are out there keeping them honest. Surely it’d be just as easy to actually hijack the damn plane. More to the point, I’ve had colleagues whose neighbors have been accused of being crisis actors, participating in a false flag operation, being in on some conspiracy, and frankly it’s just offensive and completely disregards the real pain survivors–the feelings of which people on this blog so frequently argue of are paramount importance–go through in the aftermath of a senseless disaster. The flaperon alignment is in all the same at estimated ~20 degrees flap deployment on take-off. You’re right about the flaperon moving dynamically (and automatically) on changing conditions and attitude of the plane while the outboard-flap doesn’t. What exactly happened at the end of flight (pilot input, plane attitude etc.) is still only guessing ofcourse. My point is, there is also a deployed and drooped position of the flap/flaperon in which they align around ~20 degrees outboard-flap deployment. If this can be proven it contradicts the ATSB evidence there is only one position in which outboard-flap and flaperon align: fully retracted. BTW, did you consider your aileron/flaperon diagram? Can you find/post also an outboard-flap/flaperon diagram (I couldn’t? I think you might be onto something with regard to Geoffrey Thomas’s motivations and the death threats against Blaine Gibson, which would otherwise strain credulity. Who exactly would want Gibson dead and why? It certainly isn’t the hijackers, who potentially intentionally planted the debris that Gibson has so conveniently found. And certainly anyone willing to kill several hundred airline passengers would have no problem with one more rootless wanderer like Gibson. Is it the Malaysian government? In some scenario we could imagine they could be upset that he has found evidence that could either implicate them or push them to continue the search they don’t want to undertake. But others beside Gibson have found plane pieces and they presumable would have continued to do so whether or not Gibson was scared off the case. It would not be the NOK, either. To me that leaves two possibilities. Gibson and his supporters or a journalist who is pursuing an alternate theory of the case and who has otherwise found the debris somewhat supportive of that theory, which implicates perpetrators. It’d be more likely that you were the one to receive death threats–or actually meet death–than anyone else. Yeah, actually that only leaves one possibility: Gibson and his supporters. Dig around about operation Cointelpro and Gladio, which have been declassified and are public knowledge. The MH370 event has all the markers of an Intel operation, getting hard evidence of this will be unlikely. However, I’m hoping that some tiny but significant mistake will come back to bite them and reveal the culprits. I don’t think it’s a wild card thrown at the table by the IG/Victor Ianello. It’s a further thoughtfull distraction from their own failed ‘close-to-the-arc’ calculations and assumptions. North of 25S is against all their own (and others) previous calculations and studies. They still refuse to look at their failed assumptions and now choose to change the goalposts instead, without any explanation to anyone why their previous data and believes are not valid anymore. Trying to sell another ‘close-to-the-arc’ scenario to the ‘public’. Why this distraction and denial? I think it’s suspisious at least regarding specific IG-members. Is the area north of 25S believable? In short: no! Not based on the known data and studies. Also not according the previously fiercly defended calculations and studies done by the IG themselfs. Based on the data and studies known now (and accepting they are genuine!) the crash-area should be between ~29S and ~35S but oudside the searched width. This means the plane must have glided outside this area and was most probably controlled till impact. This is the big ‘elephant in the room’ the IG tried to avoid at all costs from the get-go of the search. And they still do. Although I see some shifting between IG-members and contributors on VictorI’s blog. The sad thing it’s now too late. They’ve been fed and warned with other information contradicting their assumptions numerous times by me and others while the search still had a chance investigating certain areas outside the +/-25Nm zone. This all has been ridiculed, ignored, frustrated, intimidated by some IG-members constantly. Why? I think it’s suspisious at least regarding some specific IG-members. The suggestion by the IG to search north of 25S is no more then a red herring IMO. D.Gallo’s opinion that the plane didn’t go SOUTH is NOT the same as saying the plane went NORTH. Perhaps he feels the plane went WEST! If we now call into question the validity of the Inmarsat data, why should we believe that the plane NORTH? It could just as easily have gone to the Maldives, Diego Garcia etc. Blaine Gibson’s actions suggests that he is working with IG and ATSB but not with Malaysia. Malaysia’s interests in this case are not the same as IG/ATSB’s. The IG/ATSB presumably could be guided by BOEING/USA which has different interests in this case from Malaysia. Perhaps Blaine Gibson was hired by the US NAVY to ‘find’ the debris in islands on the Indian Ocean, debris that originally washed up on Diego Garcia whic is not accessible to the general public. Diego Garcia is by far the closest inhabited island to the crash zone. @CliffG, If the data was spoofed, someone has to propose a mechanism by which it could have occurred. As far as I know, I am the only one to do so, and it results in a flight path to Kazakhstan. Maybe we should negotiate real estate. How much km2 do you need for your 2019 OI search? First their should be a serious evaluation on why the plane has not been found by OI in the most probable areas between ~28S and ~35S based on the known data and studies. The data and studies that lead to the previous high probability area are basically wrong. Or the assumption of a close to the arc uncontrolled high speed impact is wrong. While there is no proof yet brought forward this data and studies are basically wrong somewhere, there is much more reason to suspect the assumptions on ‘close to the arc’ have been wrong. There is no reason at all at this stage to venture possibilities north of 25S, again based on the ‘close to the arc’ assumptions. First the validity of the data and studies have to be evaluated on what could have been basically wrong with them. Only after this has been done first, other possibilities should be considered. I did not say the Inmarsat data was spoofed. It took Inmarsat a week to figure out the plane went south. During that time, Inmarsat could have come under pressure from USA to ‘adjust’ the BTO data so that the data suggests the plane went SOUTH, when in reality the plane could have gone further WEST, closer to the US military base of Diego Garcia. FACT: the BTO data is quite solid and does not provide much wiggle room, yet the current search effort along the 7th arc has come up empty. FACT: Blaine Gibson, an ordinary US citizen with no credentials appears to have extraordinary access to the search authorities. INFERENCE: Blaine must have been given clearance from the US govt. to dialogue with the ATSB and Malaysian govt. FACT: Blaine appears to have extraordinary luck in finding MH370 debris. INFERENCE 2: Debris was recovered from somewhere else in the Indian Ocean where the general public cannot access it, such the US military base on Diego Garcia, and transported to the locations where Blaine found it. FACT: Blaine appears to side with the ATSB/IG and NoK, but not Malaysian govt. INFERENCE: Blaine serves the interests of ATSB/IG and by extension those who are directing them, the US govt./BOEING/INMARSAT/UK govt. FACT: Ghislain was warned the disappearance of MH370 was connected to intelligence agencies, and was warned not to go to the USA, or he may get killed. FACT: Ghislain received no support or information from the French govt. INFERENCE: the French govt. is reluctant to release what it knows, is waiting for someone else (Malaysia, USA?) to take the initiative before releasing its own information. @Ge Rijn. There is a lot of flaperon movement in your video but the abreast shot of the Delta in the air at 9:37 is from a good angle. The flap looks extended more there to me but evidently I have not convinced you by the mechanism diagrams and the deployment schedules that the flap will extend further than the flaperon, even at 20 deg. I agree about alignment that, “If this can be proven” the ATSB’s claim is wrong, but to me the evidence from the mechanics is otherwise as I have described. It is different when there are no engines and the PFCS reverts to secondary, when the flaperons droop independently to 20˚, “when the flaps and slats are not retracted”. That does not apply of course to a powered ditching. I doubt I can add any more. @Ge Rijn. Correction. After 15 and 20 please delete degrees. First please take a look at your diagram, it states: ‘aileron and flaperon control’ not ‘flap and flaperon control’. To me the vids are still rather convincing. On all, left and right wings, the flap and flaperon show alignment of the trailing edges shortly after take off. Maybe the problem is translation of units/position flap into droop degrees flaperon? How many degrees flaperon droop translates to 10 units (position) flap for instance? To be more clear perhaps; I don’t want to suggest or prove the alignment between flaperon and outboard-flap trailing edges is as perfect as when both are completely retracted. I now conclude that there is also sufficient alignment in specific deployed and drooped states (e.g. take-off and landing) between outboard-flap and flaperon other than fully retracted that could explain the ATSB narrative the flaperon trailing edge hit and punctured the outboard-flap seal-pan and using this as evidence the flaps and flaperon were fully retracted when they seperated. If this can be proven wrong then this ATSB evidence is no longer valid. I only find videos as evidence this ATSB evidence is not valid. No diagrams or other hard data. I hope(d) you could find those in your resources. @Ge Rijn, You wrote, “If this can be proven wrong then this ATSB evidence is no longer valid.” Not quite. You are arguing that there is an alternate interpretation for the damage-pattern on the flap and flaperon, that they could have been aligned while deployed. What you are forgetting is that there are multiple other reasons to think that the plane was not ditched. You would still have to explain away why a pilot who intends to ditch would let the plane run out of fuel, and then either put it into a high speed dive or allow it to fall into a high speed dive. I’m sure that being a clever lad you can come up with explanations, but the fact is that rather than following the evidence, you are struggling against it. I’m essentially arguing that the ATSB-evidence in this case is not valid. I personally don’t even believe the damage-pattern on the outboard-flap seal-pan was caused by the flaperon trailing-edge hitting it, retrackted or deployed/drooped. When we can prove though this ATSB evidence brought forward could also occure in a deployed/drooped configuration this will make this ATSB evidence worthless and leaves room for other explanations of the damage-pattern. Hope you get what I’m after in the first place now. @Ge Rijn. Look again please. The base of the diagram is labelled ‘flap position’. The diagram exresses the relative movement between the two. I also described that in words. Thanks and excusse me. Only now I see the flap position mentioned under the bottom line.. The diagram says; ‘aileron and flaperon control’ which confused me. Still I see here also the flaperon is linear with the outboard-flap between 15 and 20 units flap in all modes normal, secundairy, direct). Doesn’t this further confirm my interpretation of the videos and the ATSB evidence, the flaperon and outboard-flap are not only in-line when fully retracted but also between 15 and 20 units flap deployment? @Ge Rijn, Arguing that the evidence is wrong–not just the physical damage to the flap and flaperon, but all the other evidence as well–is a very poor foundation for your case. This is getting a little tiresome. Recently I did a FS9 flight to see how quickly could make it to ~32 South from Arc5 ping, and I got there by 23:30 and I could make Dordrecht Hole by 00:00. MH370 could have been almost all the way to BR by the 23:14 sat call, and maybe MH370 was indeed on the way there. Until now the assumption is an active pilot would receive the 23:14 satellite phone call, and being an uneducated person, he/she would not have given the slightest thought that satellite communications might leave some GPS trace. I wonder about that now. I think it’s in the details. Proving one piece of important official evidence is wrong opens up the possibility other official evidence is wrong also. If you could find one possible piece of conclusive evidence the debris was removed mechanically (by humans) you would sort out the details also to make your case I guess? Overall I think it’s important now to first evaluate the data, evidence and assumptions that lead to another failed search. @Ge Rijn, Now you’ve wandered into the epistemological black hole, where no facts can be considered valid. This kind of discussion is worse than fruitless, and future comments along these lines will be held. I’m almost never on the same page as Ge Rijn, but by way of exception, I do think he has a point here (in his last posting): If we find 1 piece of tampered evidence, obviously the question imposes itself what other pieces got tampered with. @Ge Rijn. Yes I understand your misunderstanding threw you right off. You might like to go back over our discussion anew. Even though the flap reaches the same angle down as the flap units at 20 deg the flap’s extension per unit angle is higher throughout I believe, including at 20. The units of the outer flap are near enough degrees based on the ATSB photograph of the two at full extension. I suspect they are called units because deployments of both flaps are to these units and the inners may rotate at a different rate to a different angle; and anyway the rotation per unit may not be linear with degrees throughout though one for one is the average at full extension. Following what Jeff Wise says the internal seal pan damage indicates flap separation when retracted or close to which reinforces the ATSB view. I remain unclear why the penetration of the flap is a little ahead of its rear spar though. I think it is worthwhile prompting a look into such things in case a conclusion like this is wrong somewhere but that does not seem to have been the case here. The (as I see it) automatic flaperon extension to 20 deg on loss of engines had there been ANY flap extension, and the effect of that at high speed are something I will bear in mind though. @Ge Rijn. In suggesting you review our earlier discussion I should have done so myself. To be merciful by saving belabouring things even more here, I attach some corrections, not that they make a difference to the outcome. @Lex Luthor, While I’m all about providing a big tent, Ge Rijn has crossed into “Nothing is True and Everything is Possible” territory. If you’re so convinced that your story is true, that all evidence against it must be imaginary, then you’re in the territory of blind delusion. I know some people will say, “But Jeff, you’re arguing that the Inmarsat data is made up!” No, I’m not. I am accepting the Inmarsat data is real, but propose that it was generated via a specific mechanism that the ATSB has decided not to address. Likewise, I accept the collected debris as real, but argue that its current condition cannot be best explained by years-long drift from the eastern SIO. Amongst other things. the group were interested in finding ways to use SatCom data to help locate missing planes. Of course all the usual aviation industry experts were involved, including INMARSAT. @Jeff Wise: Thanks for explaining. Just to be clear: I hadn’t followed all of GeRijn’s arguments (flaperon etc), but referred to his last point only, namely that IF 1 piece of evidence turns out to be planted, this calls into question the legitimacy of all other pieces as well. Not just for MH370 but in any criminal case. @Boris Tabaksplatt: This is very interesting! I recall that Inmarsat said something along the lines of “this [i.e. the use of SatCom data to help locate a missing plane] has never been done before”. I mean, technically they might be correct, as maybe it has never been used in an actual search – but to me the statement was made to sound like or to imply that it has never been done before, PERIOD. (neither in an actual search nor at a conceptual stage). In light of your information, I find Inmarsat’s statement only half-true at best or misleading at worst. Found a few red flags concerning INMARSAT and I don’t think the organisation is what it seems to be. When they eventually released the MH370 data they put in a caveat that inferred that the their analysis made the assumption that the data was genuine. Can’t find their exact quote, but at the time thought that this gives them deniability should the search fail. You don’t make any technical/logical arguments only conspiracy theories. After the failure of the search effort I am beginning to have doubts about the Inmarsat data from which the search areas were defined. The search areas are based on both BTO and BFO. 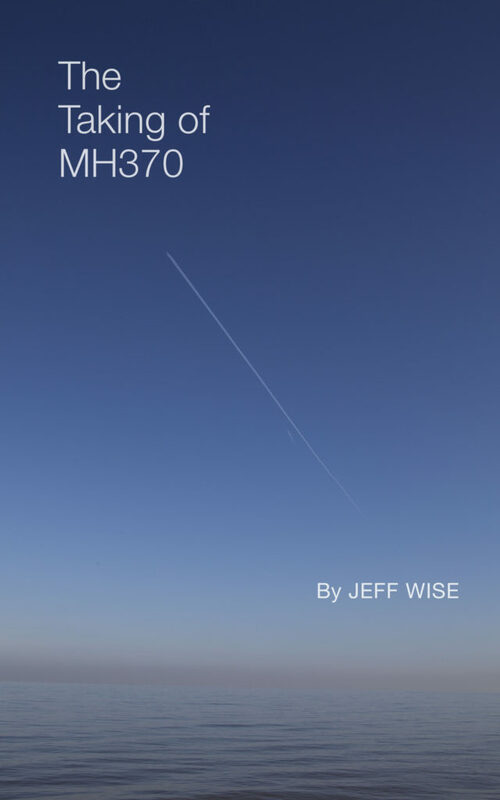 The biggest contribution that you, Jeff Wise, have made to solve the MH370 mystery is to posit the NORTHERN route. And the NORTHERN route unquestioningly accepts the BTO as true and uncorrupted, but not the BFO. What I have come to realise is that you have successfully made the general public accept the BTO as true. I don’t accept the BTO as true anymore, and I am now taking the concerns of NoK Ghislain Wattrelos seriously. He didn’t believe the Inmarsat data from Day One (day 5 to be precise). I am enormously grateful to you for this forum where we, the general public, can question and debate all issues related to MH370. But sometimes we fail to realise that you are an American first. Heck, you even wrapped your Twitter image in the American flag! So tell us please Jeff, why did you question the BFO, but not the BTO? @CliffG, There is a major difference between Ghislain Wattrelos’ worlview and my own. Ghislain is distrustful of the investigation and thinks that any and all of the evidence presented might have been falsified. I believe that the investigation has been conducted in earnest, and the evidence presented is real. The reason I think that the BFO has been falsified, but not the BTO, is that there is an identifiable mechanism by which the BFO can be tampered with, but there is none for the BTO. Secondarily, no one outside of Inmarsat apparently knew that the firm was logging BTO values, so there would be little motivation to spoof it.